... I’m talking about those pieces that we just can’t seem to throw away. They really don’t fit the bill to be saved as cutoffs, being oddly shaped or having varying thicknesses . We will probably never use them, but keep them nonetheless. Why? I keep mine because … well … you just never know. Show us your scraps and offer justification for keeping them! Heh, I hauled several wheelbarrow loads out of my shop, small pieces like those. Did it twice last year. No pics though. Amazing what you can pack rat. Did you haul them out of the shop only store them in a special shed out back for unusable scraps? LOL! As I like to make toys; many of those scraps are perfect pieces for some part of the toys. Small hardwood pieces make bottle openers etc. too. I even make wooden bolo ties with a rawhide neck strap from some. 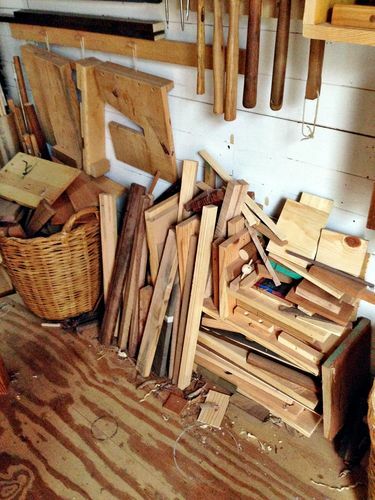 The smaller softwood pieces usually end up in the fire kindling bucket. No photo from me yet, but I have multiple piles. One of hardwood scraps. One of pieces too small to be anything but knife scales, but maybe I’ll glue them together and make some neat banding or striped multi-wood knife scales (while recovering from back surgery, I did glue up some pieces “just in case”). And then there’s the pile of construction lumber scraps. They turn out to be useful for jigs or other work-holding just often enough that I don’t throw them away until they’ve been drilled into or are full of saw dings or some other battle scars. No photo from me yet, but I have multiple piles. One of hardwood scraps. One of pieces too small to be anything but knife scales, but maybe I ll glue them together and make some neat banding or striped multi-wood knife scales (while recovering from back surgery, I did glue up some pieces “just in case”). And then there s the pile of construction lumber scraps. They turn out to be useful for jigs or other work-holding just often enough that I don t throw them away until they ve been drilled into or are full of saw dings or some other battle scars. I see you guys agree … this stuff is priceless! It was from this very pile of useless pieces (see OP) that I made the secret pop out drawer in Fr. Chad’s Prie Dieu! I store longer stuff but as cut offs become short enough to fit into a 5 gallon bucket that is where they get stored. Once the bucket is full I do a quick sort at the burn pile. Maybe a piece or two makes it back to the shop. At first I stored a lot more but then it became fairly obvious that much of it wouldn’t get used until years later. At that time I decided having a clean space with materials, tools, etc. was a better use of my time than keeping up with scrap pieces, looking for pieces, etc.. I throw really small bits away, but I do have plenty of scraps that I’ll probably never use. I keep them because I will use some of them. Well, I guess I must admit, I’m one of those “never throw anything away” people. 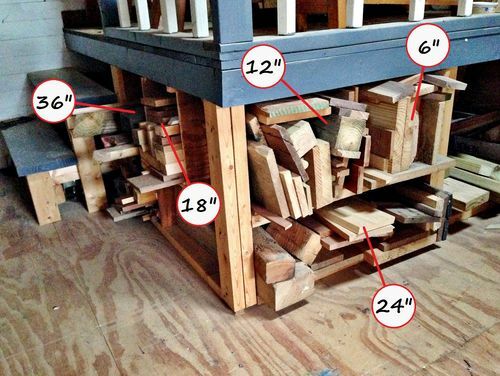 This is especially true with hardwoods – which I see as potential contrasting pegs for a mortise & tenon joint, some plywood that may become a jig someday, and clear pine that has great potential for small projects. About the only thing I toss is the hand plan shavings & any sawdust. 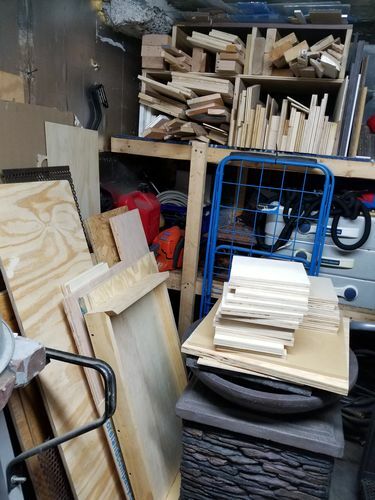 Don’t have any pictures though, it’s scattered around: garbage can full out back, plus a lot in the garden shed, some under the lathe stand, in the corner of the shop, under the drill press bench, etc. I keep tellihg myself I need to get rid of this stuff to make room to do woodworking, but just picking it up & looking at it brings to mind the many potential uses for it. At first I stored a lot more but then it became fairly obvious that much of it wouldn t get used until years later. At that time I decided having a clean space with materials, tools, etc. was a better use of my time than keeping up with scrap pieces, looking for pieces, etc..
I’ve yet to create a burn pile. I do continually sort smaller and smaller pieces, but keep finding things that I just know I’ll need one day. Perhaps I have the hoarder gene. LOL! ... some of them end up entertaining my daughter when she s in the shop with me. That’s reason enough to keep the scraps! ... but just picking it up & looking at it brings to mind the many potential uses for it. I’m with you, Tom. Like I said … you just never know! I hide “scraps” all over the place. The one picture is of our laundry folding table in the laundry room. 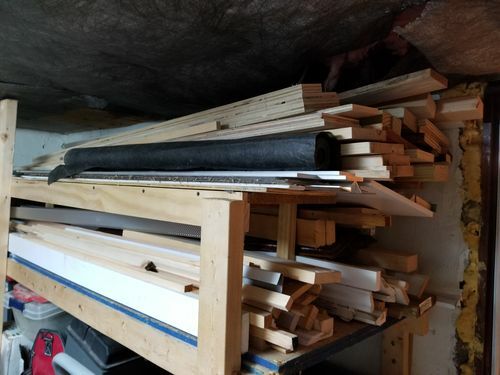 I store hardwoods and some steel there. I have a storage room for household stuff and my treasure. Just can’t seem to part with some of these things, even the smallest scrap some times. A teacher once told me it isn’t “scrap” if you make something from it. LOL. Nope, burned them. I’m a packrat but I do use a lot of those small pieces for drawer knobs or other such things. But at some point even I have to get rid of some of it. So last spring I burned about 3 wheelbarrow loads and again last fall I burned about 3 wheelbarrow loads. I had scraps from a new shed roof, 2×4 cuttoffs, and couldn’t stand to throw them out so I made little tables. I hide “scraps” all over the place. The one picture is of our laundry folding table in the laundry room. I store hardwoods and some steel there. I have a storage room for household stuff and my treasure. Just can t seem to part with some of these things, even the smallest scrap some times. A teacher once told me it isn t “scrap” if you make something from it. Wow, Kelly. Not sure I would class this as scrap … looks like some pretty decent lumber stores to me! I don’t like to toss out small pieces so I bought some low storage bins and sorted through my scraps by type. I have the bins stacked under a worktable. Now if I need a small piece of walnut, I just need to grab that bin and see if I can find a match. 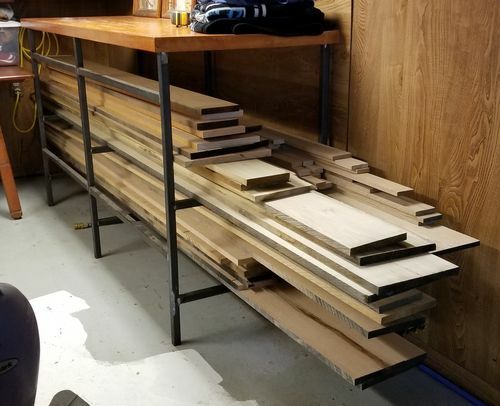 Much better than when I had all the various scrap pieces mixed in the top section of my wood rack.